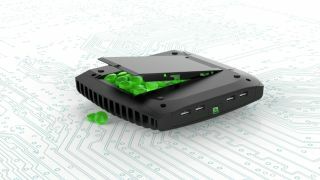 Embedded computing specialist CompuLab and Linux Mint are gearing up to launch a new open source MintBox PC with upgraded internals. For those unfamiliar with the Israeli company's diminutive machines, MintBoxes ship with the Mint version of Linux, which is based on the popular Ubuntu distribution of the operating system. It has been reported that the new MintBox 2 is four times more powerful than its predecessor, the MintBox Pro, while being roughly the same price. That's in part due to CompuLab dropping its AMD processor in favour of an Intel i5. HDD space has doubled from 250GB to 500GB, and Ethernet has jumped from Gigabit to Dual Gigabit. Only RAM has fallen, halving from 8GB to 4GB. The MintBox 2 runs the Linux Mint 15 'Cinnamon' user interface. The latest version brings a host of new features, including an overhauled file manager, desklets (or widgets), a screen saver, the inclusion of configuration modules in Cinnamon Settings, and the ability to install 'spices' (applets, desklets, themes and extensions) from the desktop. The MintBox 2 will be available from Amazon in Germany for $599, which means it could also be offered by other European outlets following the finalisation of stock and pricing. It includes a five year warranty rather than the one year offered with previous models.